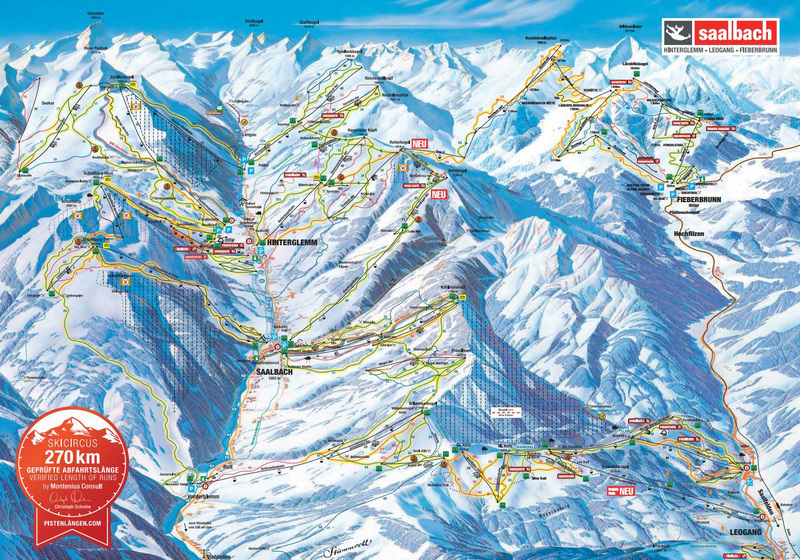 Large linked ski area with truly world class lift network makes Saalbach-Hinterglemm a skiers delight. Saalbach-Hinterglemm, now linked with Leogang and Fieberbrunn, is one of Austria’s largest linked ski areas, with 270km of slopes. With a modern lift system, essentially made up from entirely fast chairlifts and gondolas, this is a resort where you can maximise your time skiing or snowboarding. The skiing rises on both sides of a long valley, and with broad slopes nestled between forests, not only is it scenic, but great for visibility when the snow is falling. Saalbach is an attractive and traditional village set around a classic onion-domed church, whilst Hinterglemm is spread along one main street. They are 2 separate villages, 4km apart, but both are traffic free and have a lively après scene that continues into the evening. In fact, the resort claims to have the ‘best après ski in the Alps’ and with over 20 venues you will need more than a week to sample them all. This is an intermediate skiers paradise, and the resort has created 5 routes around the mountains to showcase the extent of the ski domain. The longest traverses 68 km and 12,000 metres in altitude, and if you include short breaks, we are talking about a whole day tour, which is probably the longest of its kind in the Alps. With more than 60 cosy ski huts, numerous snow parks, freeriding parks, floodlight slopes and toboggan runs, the region is one of the most diverse ski areas in the Alps.